What do you do, when there is nothing left that can be done? What happens when a loved one is desperately ill, the doctors have tried everything, and now you are told they have exhausted medical science in trying to find a cure? What do you do when the ground upon which you are standing is ripped away? When you try to breathe but the air won’t go in or out and the room starts to spin. The stark reality is that life as you know it – as you need it to be – is over. And in its place is a darkness filled with pain and fear. What happens? What do you do now? At some point, after the initial trauma of learning that your loved one isn’t going to get well again, there needs to be a shift of focus. Most people live with the illusion that we will live for an unlimited quantity of time. With the inescapable recognition that life is finite, a more concerted emphasis needs to be placed on quality of life for the duration of time your loved one has left. Jewish Hospice is based on the principle that even if there is no cure to an illness, one must always care. The Jewish Hospice Program in Toronto is a visiting Hospice. We visit the terminally ill who reside at home to provide support commensurate with the needs of each patient and his or her immediate family. Jewish Hospice offers a multidisciplinary team consisting of a palliative care physician, a social worker, a volunteer coordinator and a chaplain who work collaboratively in addressing the psychosocial and spiritual needs of each client. Jewish Hospice focuses on symptom control and pain management, the accessing of relevant and appropriate social services, the provision of volunteer support to enable caregiver relief as well as spiritual and religious care corresponding with the needs of the client. Jewish Hospice can immeasurably assist in enhancing the quality of life for a person as (s)he nears the end of life. It also can provide invaluable support to the patient’s caregivers. However, Jewish Hospice has not always had an easy time gaining acceptance in the Jewish community. The concept of Hospice was originally understood as a place people went to die after doctors had given up hope of curing the patient’s disease. If medical science could not restore a patient to health, many saw Hospice as the place where the patient was abandoned to await death’s arrival. Judaism, with its theological focus on life in this world, originally saw the idea of Hospice as antithetical to its beliefs. Many in our community, especially amongst the more observant, mistakenly continue to believe this passive approach to be the Hospice experience. To clarify: Judaism asserts that every moment of life is precious and of infinite value. Life in this world is where we have the ability to observe the mitzvot (commandments) and to strive to fulfill the word of G-d by making this world a better place for all people to live. This opportunity stops only when we die. Judaism, therefore, places great value on life and strives to maintain life in this world whenever possible. But, as we all know, no one lives forever. If Hospice was originally seen as a place to die, I believe we have now reached a “second generation” definition within the Jewish community: Jewish Hospice is now seen as a means of enabling a person to live as well as possible for as long as possible. And this new way of looking at Hospice and at caring for the terminally ill is very much in consonance with Jewish philosophy on life. I had my first exposure to Hospice care some thirty years ago. Serving as a young, and inexperienced, congregational rabbi in Binghamton, New York, an elderly member of my congregation became terminally ill. I visited with her and her husband at their home, offering whatever succour and comfort that was mine to give. However, as the trajectory of her illness began its inevitable decline, she could no longer be cared for at home. The physical demands of her daily care were simply too much for her, also elderly, husband. Together they sought help and found refuge in the local community residential Hospice. This Hospice was affiliated with a hospital in Binghamton and provided palliative care on site where her physical needs could be addressed as she lost more and more of her ability to function. I continued to visit them there and found that, although the Hospice was not grounded within our religious tradition, the staff was caring, sensitive and respectful of this elderly couple’s Jewish identity. She was dying physically; he was dying emotionally. They were both suffering individually and collectively. I had a lot to do (and learn) to provide them with appropriate levels of support. Shortly after her admission to residential Hospice, her husband confided in me that he and his wife were both enormously troubled by a date that would soon arrive on the calendar. In a few days’ time they were to celebrate their 62nd wedding anniversary, but neither of them felt like celebrating. Painfully aware that this would be their last anniversary together, the occasion was weighing upon them heavily. Their emotions were dragging them down like an albatross and the contrast between where they wanted to be and where they were was too stark, and too harsh, for them to handle. He told me that he didn’t know what to do; every time he thought of their upcoming anniversary and their married life together, he started to cry. He admitted that he didn’t know what he would do without her. He could not imagine life without her at his side. Then he told me that, as bad as it was for him, it was worse for her. It was clear that he was reaching out to me, decades younger, but equipped with the title “rabbi” – which he presumed to be synonymous with wisdom. He was in desperate need of guidance and direction. I told him that when you love someone and let them into your heart they become a part of you. I explained that death is a misnomer. Secular society thinks of death as an end. It is a separation that irrevocably tears apart the bonds forged during life in this world. Judaism, however, views death as a transition from life in Olam HaZeh (this world) to life in Olam HaBah (the next world). Death in this world is the expiration of the guf, the body, which is a finite container for the neshama, the soul. The soul, which is the essence of the person and which is imbued with divine holiness, is eternal and lives forever. The eternal soul returns to the eternal world but, I told him, the part of her that is within you will stay there forever. I told him that she will be alive in your mind and your heart, sharing your life in the future just as she has until now, for as long as you will be alive. Unquestionably it will be different; you will have to listen in the silence to hear her voice and you will have to close your eyes to see her standing before you. But mentally, emotionally and spiritually she will always be a part of you. I thought I had done a good job comforting him. He seemed to be listening and receptive to my words and the sincerity with which they were offered. However, his reaction showed me that – WHOOSH – my explanation had gone right over his head. My attempt to provide solace failed to hit the mark. He was still focused on the upcoming anniversary; his wife’s deteriorating physical condition and their distress that this would be their last anniversary together. I didn’t know what to do to help them. Unbeknownst to me, the Hospice staff was already aware of the upcoming anniversary. (It was one of the pieces of information requested on the forms for registration.) When he came to her room on the day of the anniversary, the Hospice coordinator followed the patient’s husband inside carrying a bag containing a small cake, a bottle of (kosher) grape juice and a couple of plastic wine glasses. A day of melancholy and foreboding was instantly transformed into a modest celebration. They both could not stop talking about how special that day had become. They spoke to me at length of how the intervention of a few caring individuals had shifted their focus. They were amazed that they could clearly recall how low they had been and how a small gesture, an expression of caring, changed that low to a spiritual high. They were holding on to both the low and the high simultaneously; the low had not gone away, of course, but now there was a high in the equation. It was clear to all of us that Hospice had made the difference. When dealing with terminally ill patients and their families, I have found that the trauma of their suffering narrows their attention span. When one is preoccupied with issues of life and death (quite literally), these concerns are so important that they block out everything else. My friend, the husband in the case cited above, illustrates this point. He had been focused on the approaching anniversary and the distressing circumstances in which he and his wife were situated. I had tried to address his angst from a theological perspective. No wonder I missed the mark. The immediate need of the people I see through Jewish Hospice is most often theological. Virtually all terminally ill patients know they are dying and have come to terms with that fact. Many want to speak with the rabbi in their quest for reassurance that their lives have been worthwhile. The rabbi is seen as a voice of religious authority; one who is able to state categorically that they have made a difference; that their lives have had a significant impact on their loved ones and those closest to them. This is meaningful and can, indeed, provide great comfort. Others are worried about the loved ones they will leave behind. How will they manage? Who will look after them? How will they care for themselves? Some wrestle with the theological questions of “why me?”, “why now?” or “Rabbi, what am I going to do?” Here, too, the individual is not always looking for a direct response to their spiritual anguish. (As if I could answer the unanswerable.) A compassionate response that acknowledges and validates their pain while admitting that we don’t have the answers they seek is, I believe, the best approach. Some people are angry at G-d. They feel their approaching death is premature and that, by all right and proper expectations, they should have had more years. They express the sentiment of having been cheated out of the life they expected to have. They are not ready to die and still have more they want to do in this world before leaving. As the rabbi is seen as G-d’s representative, I am the target for their wrath. They are angry at G-d, but take it out on me. I don’t apologize for G-d, nor do I profess to understand His ways. I do not know why they, or their loved one, got sick. But I do know that people who are hurting need someone to care about them. I will be their rabbi, or their teacher, or their friend. Sometimes my role fluctuates and goes back and forth. Sometimes it stays the same. Whatever role I can fulfil that works for them is fine with me. In serving as the Chaplain with Jewish Hospice in Toronto over the past twenty- two years, I have had the privilege of working with many Holocaust survivors. Those who managed to emerge from the cauldron that was the Jewish experience during World War II quite understandably often suffer immense psychological, emotional, and spiritual trauma. These multi-dimensional disturbances present unique challenges as the survivors and their loved ones struggle to deal with terminal illness. Allow me to cite three examples of such struggles. Actively dying often comes as a surprise. We frequently hear of how Survivors experienced multiple miracles that enabled them to elude death. Stories of “near-misses” and examples of Hashgacha pratis (Divine intervention) abound amongst the chronicles of those who endured and survived. Repeated escapes and rescues make an impact on the psyche of the survivor. They know, of course, that they will die one day. But they are often sure that it’s not going to be now. They survived before when things looked much worse, so they are sure they will get past this illness too. After the War, many survivors focused on moving forward. Often, this meant rehabilitating their health and then getting on with the business of rebuilding their lives. Grateful for a new opportunity at life, most survivors worked at learning a new language and adapting to a new country. They worked long hours trying to bury the horrors of the past and escape the guilt that frequently accompanied survival – struggling to understand why they survived and their loved ones did not. Generally, they met with a measure of success. But, for many, moving forward meant closing the door, as much as possible, to the past. The survivors, more or less, acclimated to their new places of residence. They worked hard at their jobs and as long as they were strong and relatively healthy, they were able keep the demons of the past at bay. However, advancing age is usually accompanied by illness. As many survivors get older and weaker, it becomes increasingly more and more difficult to keep the door to the past closed. Many survivors experience “flashbacks” when they get older and become increasingly infirm. A flashback is a cognitive lapse; a disturbing memory of the past that is suddenly vivid in the consciousness of the individual. The person having a flashback is instantly transported back to the past and relives the traumatic experience again- and again. It is bad enough for the trauma to have happened once, but to re-experience the horror multiple times defies description. Sometimes there is something that triggers a flashback: a noise, such as the sound of a dog barking might awaken the memory of the attack dogs in the camps; a smell, such as the odor of antiseptics in a hospital might be associated in the survivor’s mind with the chemicals used to perform hideous so-called “medical experiments” that were simply torture by another name; a sight, such as a white coat might connect the survivor to a time when doctors wearing white coats did not try to heal but, maliciously and viciously, harmed those under their control. 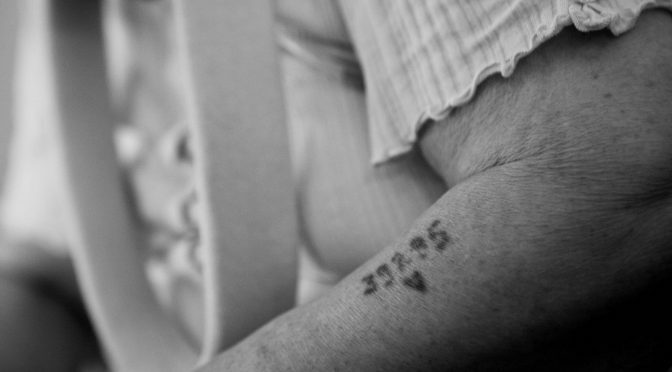 Caregivers need to understand what is happening when a Holocaust survivor has a flashback. They also need to be trained regarding a proper response that is therapeutic and helps the survivor calm down as quickly as possible. We have found that using a soft voice and an extra measure of kindness and sensitivity to reassure the survivor they are safe now and that there is no danger is most helpful. There is an established Jewish school of thought that one should not tell the patient how sick they are if the information will cause them to become depressed and give up hope of getting better. The fear behind this perspective is that hopelessness and despair will accelerate the demise of the individual and Jewish law mandates that nothing be done to hasten the arrival of death. This often results in spouses trying to protect each other from the upsetting news of a terminal diagnosis or poor prognosis. In trying to protect each other they are doing more than simply wasting time and energy. They are putting up walls that effectively prevent them from facing the challenge of terminal illness together. I must respect their instructions; I am not allowed to reveal a confidence or tell a secret. I am not a doctor who has a duty to involve his patients in their care by informing them of the nature of their disease. I work with the reality of where the terminally ill patient and his/her family are on the spectrum of acceptance or denial. I try to gently nudge both sides towards a common ground of recognizing that they will be better able to deal with all the issues they are facing, if they deal with them together. The commentaries explain that Moshe is denied physical entry into the Land of Israel, but he is given the ability to see its length and breadth; he is able to see the Land in its entirety. Moshe is given insight and clarity with which to view that which is dearest to him. He may be denied his wish to enter the Land, but Moshe is granted the ability to learn about and understand that which is most precious to him. It would seem that with this new perspective there is a spiritual acceptance of G-d’s decree. Moshe no longer asks to enter the Land; he has already connected with it in a meaningful and significant way. Jewish Hospice strives to help people live as well as possible for as long as possible. The goal of our Hospice team is to address those issues which are most important to the individual who is terminally ill and to his/her loved ones. It is our hope that through the provision of psychosocial and spiritual support from a Jewish perspective we can bring a measure of kindness and sensitivity to people struggling at what can be a most difficult time. We believe this brings comfort and healing. And, perhaps, a new perception on what is important in life.